Prior to commissioning, the new ship undergoes sea trials to identify any deficiencies needing correction. The preparation and readiness time between christening-launching and commissioning may be as much as three years for a nuclear powered aircraft carrier to as brief as twenty days for a World War II landing ship. USS Monitor, of American Civil War fame, was commissioned less than three weeks after launch. Regardless of the type of ship in question, a vessel's journey towards commissioning in its nation's navy begins with a process known as sea trials. Sea trials usually take place some years after a vessel was laid down, and mark the interim step between the completion of a ship's construction and its official acceptance for service with its nation's navy. Sea trials begin when the ship in question is floated out of its dry dock (or more rarely, moved by a vehicle to the sea from its construction hangar, as was the case with the submarine USS Virginia), at which time the initial crew for a ship (usually a skeleton crew composed of yard workers and naval personnel; in the modern era of increasingly complex ships the crew will include technical representatives of the ship builder and major system subcontractors) will assume command of the vessel in question. The ship is then sailed in littoral waters for the purpose of testing the design, equipment, and other ship specific systems to ensure that they work properly and can handle the equipment that they will be using in the coming years. Tests done during this phase can include launching missiles from missile magazines, firing the ship's gun (if it has one), conducting basic flight tests with rotary and fixed-wing aircraft that will be assigned to the ship in the future, and various tests of the electronic and propulsion equipment. Often during this phase of testing problems arise relating to the state of the equipment on the ship in question, which can result in the ship returning to the builder's shipyard to address the concerns in question. In addition to problems with a ship's arms, armament, and equipment, the sea trial phase a ship undergoes prior to commissioning can also identify issues with the ship's design that may need to be addressed before it can be accepted into service with its nation's navy. 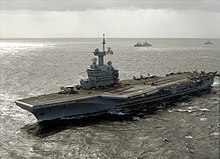 During her sea trials in 1999 French Naval officials determined that the French aircraft carrier Charles de Gaulle was too short to safely operate the E2C Hawkeye, resulting in her return to the builder's shipyard for enlargement. After a ship has successfully cleared its sea trial period, it will officially be accepted into service with its nation's navy. At this point, the ship in question will undergo a process of degaussing and/or deperming, which will vastly reduce the ship in question's magnetic signature. Once a ship's sea trials are successfully completed plans for the actual commissioning ceremony will take shape. Depending on the naval traditions of the nation in question, the commissioning ceremony may be an elaborately planned event with guests, the ship's future crew, and other persons of interest in attendance, or the nation in question may forgo a ceremony and instead administratively place the ship in commission. At a minimum, on the day on which the ship in question is to be commissioned the crew will report for duty aboard the ship and the commanding officer will read through the orders given for the ship and its personnel. If the ship's ceremony is a public affair the Captain may make a speech to the audience, along with other VIPs as the ceremony dictates. Religious ceremonies, such as blessing the ship or the singing of traditional hymns or songs, may also occur. Once a ship has been commissioned its final step toward becoming an active unit of the navy it now serves is to report to its home port and officially load or accept any remaining equipment (such as munitions). To decommission a ship is to terminate its career in service in the armed forces of a nation. 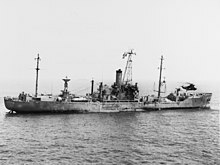 Unlike wartime ship losses, in which a vessel lost to enemy action is said to be struck, decommissioning confers that the ship has reached the end of its usable life and is being retired from a given country's navy. Depending on the naval traditions of the country in question, a ceremony commemorating the decommissioning of the ship in question may take place, or the vessel may be removed administratively with little to no fanfare. The term "paid off" is alternatively used in British Commonwealth contexts, originating in the age-of-sail practice of ending an officer's commission and paying crew wages once the ship completed its voyage. Ship decommissioning usually occurs some years after the ship was commissioned and is intended to serve as a means by which a vessel that has become too old or too obsolete can be retired with honor from the operating country's armed force. Decommissioning of the vessel may also occur due to treaty agreements (such as the Washington Naval Treaty) or for safety reasons (such as a ship's nuclear reactor and associated parts reaching the end of their service life), depending on the type of ship being decommissioned. In a limited number of cases a ship may be decommissioned if the vessel in question is judged to be damaged beyond economical repair, as was the case with USS Liberty, USS Halibut, and more recently with Costa Concordia. [a] In very rare or extraordinary cases, a navy or its associated country may recommission or leave a ship that is old or obsolete in commission with the regular force rather than decommissioning the vessel in question due to the historical significance or public sentiment for the ship in question, as has been the case with the ships USS Constitution and HMS Victory. Vessels preserved in this manner typically do not relinquish their names to other, more modern ships that may be in the design, planning, or construction phase of the parent nation's navy. Prior to its formal decommissioning, the ship in question will begin the process of decommissioning by going through a preliminary step called inactivation or deactivation. During this phase, a ship will report to a naval facility owned by the country in question so as to permit the ship's crew to offload, remove, and dismantle the ship's weapons, ammunition, electronics, and other material that is judged to be of further use to the nation in question. The removed material from a ship usually ends up either rotating to another ship in the class with similar weapons and/or capabilities, or in storage pending a decision on equipment's fate. During this time a ship's crew may be thinned out via transfers and reassignments as the ongoing removal of equipment renders certain personnel (such as missile technicians or gun crews) unable to perform their duties on the ship in question. Certain aspects of a ship's deactivation – such as the removal or deactivation of a ship's nuclear weapons capabilities – may be governed by international treaties observed by the country in question, which can result in the presence of foreign officials authorized to inspect the weapon or weapon system in question to ensure compliance with a given treaty. Other aspects of a ship's decommissioning, such as the reprocessing of nuclear fuel from a ship utilizing a nuclear reactor or the removal of hazardous materials from a ship, are handled by the government in question according to the nation's domestic policies on such matters. When a ship finishes its inactivation, it is then formally decommissioned, after which the ship is usually towed to a storage facility. In addition to the economic advantages of retiring a ship that has grown maintenance intensive or obsolete, the decommissioning frees up the name used by the ship, allowing vessels currently in the planning or building stages to inherit the name of the warship in question. Often, but not always, ships that are decommissioned end up spending the next few years in a reserve fleet before their ultimate fate is decided. Sir, I have it in command from the president of the United States, to direct you to repair with all due speed on board the ship Constellation lying at Baltimore. It is required that no Time be lost in carrying the Ship into deep water, taking on board her Cannon, Ammunition, Water, Provisions & Stores of every kind — completing what work is yet to be done shipping her Complement of Seamen and Marines, and preparing her in every respect for Sea ... It is the President's express Orders, that you employ the most vigorous Exertions, to accomplish these several Objects and to put your Ship as speedily as possible in a situation to sail at the shortest notice. In Truxtun's time, the prospective commanding officer had responsibility for overseeing construction details, outfitting the ship, and recruiting his crew. When a captain determined that his new ship was ready to take to sea, he mustered the crew on deck, read his orders, broke the national ensign and distinctive commissioning pennant, and caused the watch to be set and the first entry to be made in the log. Thus, the ship was placed in commission. Commissionings were not public affairs, and unlike christening-and-launching ceremonies, were not recorded by newspapers. The first specific reference to commissioning located in naval records is a letter of November 6, 1863, from Secretary of the Navy Gideon Welles to all navy yards and stations. The Secretary directed: "Hereafter the commandants of navy yards and stations will inform the Department, by special report of the date when each vessel preparing for sea service at their respective commands, is placed in commission." Subsequently, various editions of Navy regulations mentioned the act of putting a ship in commission, but details of a commissioning ceremony were not prescribed. Through custom and usage, however, a fairly standard practice emerged, the essentials of which are outlined in current Navy regulations. Craft assigned to Naval Districts and shore bases for local use, such as harbor tugs and floating drydocks, are not usually placed in commission but are instead given an "in service" status. They do fly the national ensign, but not a commissioning pennant. In modern times, officers and crew members of a new warship are assembled on the quarterdeck or other suitable area. Formal transfer of the ship to the prospective commanding officer is done by the Chief of Naval Operations or his representative. The national anthem is played, the transferring officer reads the commissioning directive, the ensign is hoisted, and the commissioning pennant broken. The prospective commanding officer reads his orders, assumes command, and the first watch is set. Following, the sponsor is traditionally invited to give the first order to the ship's company: "Man our ship and bring her to life! ", whereupon the ship's assigned crew would run on board and man the rails of the ship. In recent years, commissionings have come to be more public occasions. Most commonly assisted by a Commissioning Support Team (CST), the Prospective Commanding Officer and ship's crew, shipbuilder executives, and senior Navy representatives come together for a formal ceremony placing the ship in active service (in commission) to her country. Guests, including the ship's sponsor, are frequently invited to attend, and a prominent individual delivers a commissioning address. On May 3, 1975, more than twenty thousand people witnessed the commissioning of USS Nimitz at Norfolk, Virginia. The carrier's sponsor, daughter of Fleet Admiral Chester Nimitz, was introduced, and U.S. President Gerald R. Ford was the principal speaker. Regardless of the type of ship, the brief but impressive commissioning ceremony completes the cycle from christening and launching to bring the ship into full status as a warship of her nation. ^ Because the nature of cruise ship operators and other civilian ship operating entities is to not replicate the commissioning/decommissioning process that the armed forces use for their ships Costa Concordia was never placed in commission through any designated state function, nor can the ship be decommissioned in a manner consistent with those ships in service with the armed forces of a nation. The cruise ship is included here only as an example of a ship that has been damaged beyond economic repair, and as a result will be removed from service and ultimately scrapped. ^ "DHH Volume 2, Part 1: Extant Commissioned Ships". Official Lineages. Directorate of History and Heritage, Canadian Forces. 7 July 2006. Retrieved 7 January 2014. ^ a b Reilly, John C. (23 June 2014). "Christening, Launching, and Commissioning of U.S. Navy Ships". Naval History and Heritage Command. p. 5. ^ Thompson, M.S., ed. (1887). General Orders and Circulars Issued by the Navy Department: From 1863 to 1887. Washington: Government Printing Office. p. 11, 12. ^ "Navy Commissions Aircraft Carrier Ronald Reagan (CVN 76) – Release No: 473-03" (Press release). U.S. Department of Defense. July 1, 2003. Retrieved February 15, 2015. ^ Kelly, Jason (June 20, 2013). "USS Nimitz Commanding Officer Shares Ship's Legacy". US Navy. Retrieved February 15, 2015. ^ "Costa Concordia: What happened". BBC New Europe. Retrieved 2014-06-20. This article includes text from the public domain Ships of the United States Navy: Christening, Launching and Commissioning, Second Edition, prepared for and published by the Naval History Division of the Department of the Navy, Washington, D.C., 1975. This page was last edited on 3 April 2019, at 06:35 (UTC).